This page lists some of my doll and miniature projects. I am mainly interested in making fashion doll shoes, but I also make some clothes for all kinds of dolls and build dollhouses. I have even tried some doll customization. To see the Kindle books I have written about making doll shoes, click the pictures below or visit my Amazon author page. 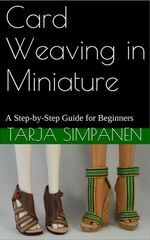 If you want to check the table of contents for Techniques for Making Doll Shoes in a PDF format, click here. If you're looking for the doll photo stories, they are at dolls.fennotrans.fi.